"What we show is that the Dark Zone is covered in a finely distributed layer of dust, and black carbon, which provide nutrition for dark coloured algae. These are the main cause of the darkening." says professor Alun Hubbard, the co-author of the study and professor at CAGE—Centre for Arctic Gas Hydrate, Environment and Climate at UiT The Arctic University of Norway. The Dark Zone is a literally dirty belt of the melting area – the ablation zone – of the ice sheet. The darker this ablation zone is, the more of the sun's energy it absorbs, and the faster the ice melts. "The algae need nutrients and food, essentially dust, organic carbon, and water. In summer, these are plentiful and the algal bloom takes off. Because algae are dark in colour – they reinforce the dark zone. Thereby you get a positive feedback effect where the ice sheet absorbs even more solar radiation producing yet more melt." 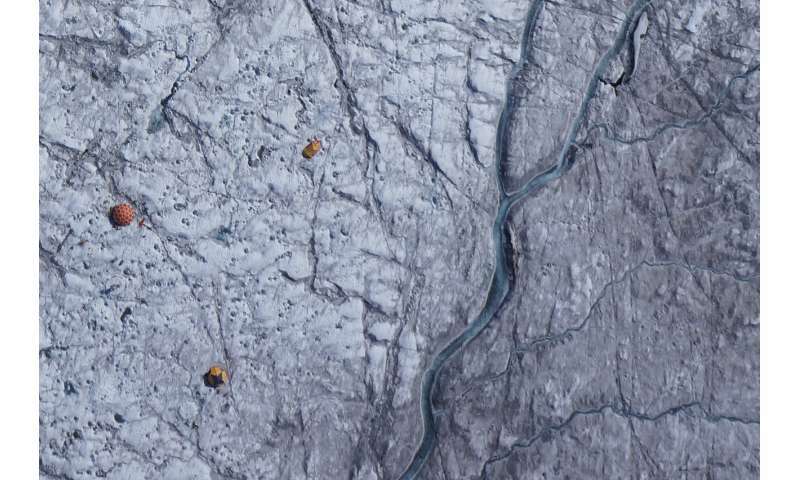 "If we compare it to camera pixels, even the best satellites for the ice sheet imaging have resolution of tens of metres. They can't see the detail of what's happening on the ground. Our fixed-wing UAVs can take hundreds of images with pixel resolutions on the centimeter scale with an operating range of hundreds of kilometres." says Hubbard.